The Case of Ablyazovs' Highlights "Lack of Political Will" to Tackle Kleptocracy in the U.K. The biggest fraud case in British history, almost nine years since the case of BTA Bank v Mukhtar Ablyazov first appeared in the U.K. courts, a new round of litigation has been set into motion, whilst lawsuits are also ongoing in France, Kazakhstan and the United States. "In this action the Bank brings a claim against Mr. Ablyazov and Mr. Khrapunov, his son-in-law, alleging a conspiracy by unlawful means," the court document reads. "The Bank has judgments for over $4.6 [now $4.9] billion against Mr. Ablyazov, and it alleges that he and Mr. Khrapunov acted together to deal with assets in breach of court orders made against Mr. Ablyazov so as to prevent it from enforcing the judgments." Having committed "fraud on an epic scale," in the words of Justice Teare, former Minister for Energy, Industry, and Trade in Kazakhstan, Mukhtar Ablyazov hightailed it out of London to France in February 2012 in order to avoid three concurrent 22-month sentences passed upon him for contempt of court. Accused of embezzling upwards of £7.25 billion in total from the bank he once chaired, with only a fraction of the missing funds having been recovered, those hardest hit by the scandal are Kazakh home buyers whose properties were never built and pensioners who saw their retirement funds disappear into a sinkhole of over a thousand shell companies worldwide which have been uncovered so far. Among numerous British institutions to suffer collateral damage, prior to being bailed-out by British taxpayers, RBS suffered losses of more than £1.3 billion. Though they often raise more questions than answers, the opaque cases of Mukhtar Ablyazov, his family and entourage serve to highlight a particularly British problem. Through a mixture of oversight, the turning of blind eyes and institutional failures, the UK has become a bolthole for politically exposed persons and a haven for money laundering kleptocrats hiding behind anonymous offshore mailbox companies. Only now, in the wake of the attack on Sergei and Yulia Skripal, is the Treasury Select Committee understood to be in talks regarding a potential investigation into money laundering. Mukhtar Ablyazov’s son, Madiyar was born in Almaty, Kazakhstan in 1992. At the age of ten, he moved to London to live with his aunt and uncle, the Shalabayevs’, settling into the opulent surroundings of Carlton House on Billionaire’s Row in Highgate. A seven-bedroom mansion replete with an indoor leisure complex, a pool, and a Turkish baths, this was one of four London properties owned by Mukhtar Ablyazov. 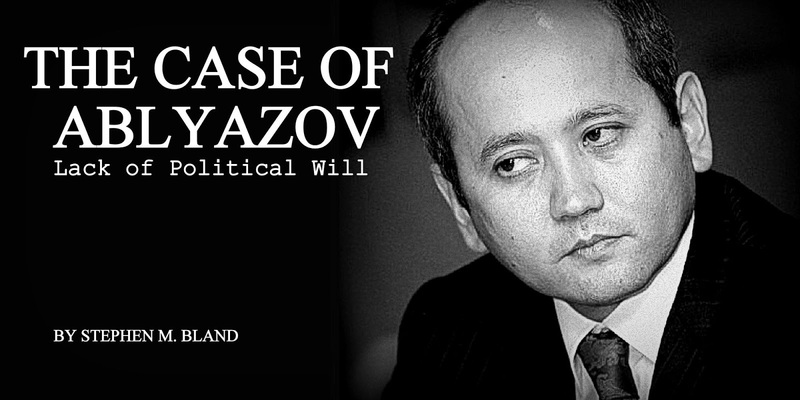 With the authorities in Kazakhstan closing in on Mukhtar Ablyazov - where a huge black hole in BTA Bank’s finances had become apparent - in 2008, Madiyar’s family began looking for alternatives which would allow him to remain in the U.K. upon the expiration of his student visa. The Ablyazovs’ settled on the Tier 1 Investor scheme, which at the time granted individuals residency as a path towards citizenship in exchange for an investment of £1 million in the U.K. At the end of this investment period, this sum would then be returned to the applicant along with any interest accrued. In a farce worthy of Yes Minister or The Thick of It, from 2008 - 2015 the Home Office approved Tier 1 Investor visas thinking the applicant would then open a bank account thus leading to due diligence being carried out by the banks, whilst banks took the issuance of the visa as proof that due diligence had already been carried out by the Home Office. During this so-called "blind faith" period, a total of three thousand "golden visas" were issued. Part of a system which inherently assumes that wealthier people make better immigrants, the names of applicants were hidden behind a wall of secrecy until 2016 that is when a new strand of the multiple Ablyazov cases came before the High Court of Justice. With a payment of £1.1 million having been transferred into an account in Madiyar’s name at EFG Private Bank Limited in London, the Ablyazovs’ filed a "memorandum of gift" with the U.K. Border Agency, naming his father – already on the run from Kazakhstan at this juncture - as his benefactor. Despite the growing storm of well-publicised fraud allegations swirling around Mukhtar Ablyazov, in July 2009 Madiyar duly received his Tier 1 Investor visa. In September 2013, he received indefinite leave to remain in the UK, despite his father having had £3 billion in judgments passed against him in the British courts and having fled the country after being found to have acted with "cynicism, opportunism, and deviousness’ and to be guilty of ‘lying under cross-examination." "The most amazing thing about it was that there were really no background checks as far as I could tell," Lord Wallace of Saltaire, Government Whip and spokesperson in the House of Lords for the Foreign and Commonwealth Office, the Department for Work and Pensions and the Department for Education between 2010 – 2015 told me with regard to golden visas. "It demonstrates the extent to which we have preferred as a country not to look too closely at where money is coming from. It's just one of the many ways in which illegally acquired money has flowed into London." According to Duncan Hames, Director of Policy at Transparency International UK: "The three thousand individuals who benefitted from the Tier 1 Investor system between 2008 and 2015 represent ongoing money laundering risks due to the fact they gained visas before any due diligence was carried out on them. Retrospective source of wealth checks should be carried out on these individuals to ensure the UK does not continue to harbor those benefitting from corrupt wealth." Since 2015, changes to the Tier 1 Investor scheme have seen increased due diligence and the amount it is necessary to invest being raised to £2 million, still pocket change for the average kleptocrat. In the financial year 2015 – 2016, the number of Chinese citizens granted Tier 1 Investor visas dropped from 488 to 35, whilst the number of Russians, the second largest group, fell from 196 to 34. Though increased due diligence has played a part, this dramatic decline in numbers can largely be attributed to uncertainty regarding Brexit and other egregious examples of citizenship through investment schemes, such as those offered by Portugal, Cyprus, and Malta. To date, however, nothing has been done with regard to retrospective due diligence. "Action on the blind faith period is something that we’ve called for consistently," Naomi Hirst, Senior Campaigner at Global Witness told me. "We definitely think that those individuals that came through during the blind faith period should be subject to retrospective checks. The crux is that three thousand people came through, some of them could be citizens by now, and we really don’t know where their money came from. The government hasn’t really acknowledged the risk that we were opening ourselves up to." I asked Lord Wallace of Saltaire about the changes to Tier 1 Investor visas implemented in April 2015. "Evidently, the staggering thing is, one, that they didn’t do it before, and secondly that they don’t seem to have done much in the way of retrospective due diligence on people who had been let in earlier,’ he said.‘I would have thought [retrospective action] would be a possibility, but it would be inconvenient. Schemes like this which commoditize nationality and the absence of any proper checks meant that we were selling, first of all, the right to British residence, and then the right to British nationality. One of the things that you rapidly discover when you get into this world is that there a lot of people in London who make very good incomes out of servicing all this offshore business: the estate agents, the accountants and others who service the super-rich who come in this way." In a telephone conversation, whilst refusing to discuss specific cases, a Home Office spokesperson stated that changes implemented since 2015 have made the process more vigorous. Anyone who was granted a Tier 1 Investor visa during this period would’ve had to apply for an extension within three years if they wanted to stay, so many would’ve been subject to increased due diligence during this process. The spokesperson went on to say that the Home Office does not accept that banks were not carrying out due diligence during the so-called "blind faith" period and that this and the phrase ‘golden visa’ are inaccurate. Retrospective due diligence was, therefore, unnecessary. In a written statement, the Home Office spokesperson stated that: "We carry out a range of robust checks on all those applying for these visas. Changes have been made to the Tier 1 route to introduce new powers to refuse applications and address concerns about the source of funds used to meet the investment requirement. In addition to Government checks, banks are obliged to carry out their own due diligence checks on all Tier 1 investors." In addition to the mansion on Billionaire’s Row, at the peak of his powers, Mukhtar Ablyazov owned three other properties in and around London. There were flats in Elizabeth Court and Alberts Court in St. John's Wood, but the jewel in the crown was Oaklands Park in Surrey. Purchased through a Seychelles-based shell company in 2006 for £18.15 million, behind its wrought iron gates the hundred-acre estate boasts a 12,000 sq. foot main premises, four cottages, two log cabins, stables and a full-size polo pitch. Research released in March 2017 by Transparency International identified forty thousand properties in London alone worth a total of £4.2billion that were purchased by individuals with "suspicious wealth." A long-standing source of concern for a plethora of NGOs, according to a Home Affairs select committee report from 2016, £100 billion is being laundered through the U.K. property market every year. I spoke with Roman Borisovich, founder of the anti-kleptocracy NGO, ClampK about golden visas and the wider issues of kleptocracy in the U.K.
"Very little was done in terms of checking the background of visa applicants,’ he said. ‘I know a few people who went through it and got their golden visas and eventually UK passports because of that. In these cases, clearly, the government didn’t ask the right questions. It’s exactly how it works with real estate. In every transaction that involves the proceeds of crime, there are always at least three people who beyond reasonable doubt have knowledge of or are suspicious that the transaction is criminal; so between the banker, lawyer and the director or administrator of the offshore company where the money is coming from, there’s no chance that at least one of these three is not aware of this, because they need to understand where the money is coming from to justify the transaction." I asked Borisovich about an undercover documentary from 2015 in which he starred called From Russia with Cash, in which a high-end London estate agent comments that "eighty percent of my transactions, actually more I’d say now, are to international overseas based buyers, and I’d say fifty to sixty percent of those in various stages of anonymity, whether it be through a company or an offshore trust." "It’s not only people who lose money to these kleptocrats who suffer," Borisovich said, "it’s people who are losing their place on the property ladder; it’s people losing active members of their communities. The consequences are twofold, first, prices increase, which has pretty much made it impossible for the average Londoner to purchase anything in the centre of town, and secondly, it’s led to the appearance of ghost areas, like Ennismore Gardens, SW7, places where the majority of properties are owned by kleptocrats who don’t live there and don’t rent them out. This is also known as the “lights out London” phenomenon that devastates whole neighbourhoods. If you go to Ennismore Gardens on a weekday night or a Sunday morning, you won’t see anybody. Ten years ago, it was one of the most lively and lovely residential areas in London." It was his dabbling in real estate that led Justice Teare to find that Mukhtar Ablyazov had‘acted in contempt of court as alleged by the Bank,’ the judgement reads. i) The money used for the purchase came from Sunstone. Sunstone is a company which was undoubtedly connected with Mr. Ablyazov and in all probability, the shares in Sunstone were held for him by Mr. Udovenko. ii) Both Mr. Ablyazov and Syrym Shalabayev gave untrue evidence that Syrym Shalabayev was the owner and seller of a uranium business when in fact Mr. Ablyazov was the owner and seller. That evidence was relied upon to show that Syrym Shalabayev had the means to purchase Carlton House. These lies can only have been told to hide Mr. Ablyazov's interest in Carlton House. iii) The fact that no third party has applied to the English Court to challenge the inclusion of Mount Properties within the receivership order indicates that Mr. Ablyazov is the beneficial owner of Carlton House. iv) The transfer of shares in Mount Properties in November 2009 was probably intended to distance Mr. Ablyazov from Carlton House. v) The "lease" of Carlton House was a sham." And so the judgement continues with regard to other properties which were subsequently seized and sold off." Given the scale of the problem and the widely recognized fact that London is awash with laundered money, I asked Naomi Hirst whether the government was likely to tackle kleptocracy. "It’s been eighteen months since the Panama Papers," she said, "and back then it looked as if the government did actually sit up, take notice and recognize the scale of the problem. Subsequent to the Panama Papers, an International Anti-Corruption summit was hosted by David Cameron, and the government made all sorts of promises, not least to crack down on tax havens by bringing in public records of beneficial ownership. In the eighteen months that have passed, we’re another set of leaks on, but really we’ve seen no meaningful action from the government in the interim period and certainly not since the Paradise Papers." "We think it’s actually high time that the UK government and Theresa May delivered on the promises they made, for one thing on the union-bound overseas territories and crown dependencies, and another to clean up the UK property market. At the summit, the government promised to bring in a register which would reveal the real owners of overseas companies that own properties here, which would have a significant deterrent effect on corrupt money coming in as anonymous companies would no longer be able to buy properties. The government was also supposed to deliver an anti-corruption strategy in December 2016. It's more than a year overdue. I think it really does speak volumes about the lack of political will that the government doesn’t even have a strategy for the problems it identified eighteen months ago." One new power which came into force in the U.K. on January 31st, 2018 and could be used to tackle corruption is the Unexplained Wealth Order provision of the Criminal Finances Act, which gives law enforcement the ability to require the owners of assets to prove the legality of the funds which paid for them. Should they fail to do so or refuse to comply, those assets would then be subject to a seizure and forfeiture process. Whilst it remains to be seen how well the relevant authorities will be resourced in order to enforce this, an obvious loophole is the fact that anonymous ownership will thwart investigations. Thus, for example, with over seventy-five percent of corruption cases involving property investigated by the Metropolitan Police Proceeds of Corruption Unit involving anonymous companies, the true beneficial owner is shrouded behind layers of secrecy. "Our research suggests the UK is home to billions of pounds in corrupt assets,’ said Duncan Hames. ‘However, the system by which these funds are seized and repatriated has until now failed to achieve effective asset recovery. We expect the new Unexplained Wealth Orders to be used effectively, resulting in more corrupt assets being recovered. The success of Unexplained Wealth Orders depends in part on other government initiatives such as the long overdue register which would reveal those benefitting from the overseas companies that own UK property." Back in the world of the Ablyazovs, the last twelve months have seen an upturn in fortunes for the oligarch and his family. After having spent three years in jail in France, on December 9th, 2016, France’s highest administrative court cancelled an extradition order to send Mukhtar Ablyazov to Russia on the grounds that the request was made for political reasons. "When you have so much money, you can buy everything, but you cannot buy the French justice system," regional advocate-general, Solange Legras had crowed when the first extradition order was granted in January 2014.The decision by the Conseil d'Etat rides roughshod over every other court decision in the country to date as well as an extradition order signed by then Prime Minister, Manuel Valls in 2015. "France must refrain from extraditing an individual to a country where there are serious grounds for believing that he or she would be in danger of being subjected to torture," UN Special Rapporteur on Torture, Nils Melzer had argued just days before the ruling. In a written interview, a representative of BTA Bank described the court’s decision as "completely unexpected," expressing their "surprise and disappointment." Although the reasons behind this reversal remain obscure, an expert on the situation who wished to remain anonymous cited a low point in Franco-Russian relations as the key reason for the decision. In Britain, meanwhile, ruling against BTA Bank, on the 19th, December 2016, the Royal Courts of Justice recognized Madiyar Ablyazov as the final beneficial owner of the £1.1 million ‘gift’ from his father. "I find that it is most unlikely that Mr. Ablyazov would have embarked on the process of obtaining an investor visa for Madiyar as part of a scheme to put the £1.1 million outside the hands of any future creditors," reads the judgement by Laurence Rabinowitz QC. Nothing is mentioned in the judgement as regards the origin of these funds, which are thought to have come from an offshore company named on a prior asset freezing order. Currently working at a financial services firm and a start-up in Geneva, Madiyar Ablyazov has gone on to keep a low profile. Mukhtar Ablyazov, meanwhile - a man once said to have owned three private planes, a thousand apartments, one-hundred-and-six cars, and twenty luxury villas - continues to bemoan his "political persecution as a shield of protection against the law." A representative of BTA Bank told me that £1 billion has been recovered in the UK to date and that having been granted leave to appeal, BTA’s challenge to the court’s verdict as regards Madiyar’s ‘gift’ is set to be heard in April 2018. "London has become a centre of attraction for fraudsters," the representative stated." All the funds poured into [the UK] by so-called “political victims” successfully fuel the UK economy, which I think is very convenient." Whilst the cases of Ablyazov and his cronies have served to highlight rampant kleptocracy, institutional failures and the lack of political will to address these issues, in the wake of the Paradise Papers, the government’s latest attempts to dilute EU anti-tax haven legislation do not augur well. "The government has moved away from its commitments," argues Borisovich. "Despite the Paradise Papers, because of Brexit fears, they’re paralysed… As with the register of beneficial owners, for example, it’s not just something they promised the British public, it’s something they promised leaders throughout the rest of the world."